The internet is becoming ever more full of really incredible real time data. I’ve just found a site that shows the sources of electricity used by the Bonneville Power Administration, Pacific Northwest of America (Site here). This shows power from thermal sources being pretty constant at 3000 – 4000 MW about 1000 MW below the overnight minimum demand. Wind power is shown as providing between no electricity and 4000 MW but there being no control over when it generates. Hydro is clearly the winning technology in terms of load following going from 4000 – 9000 MW on demand. There are no surprises from this diagram but it does nicely show the variation in demand across the days and the inability of wind on its own to ever provide reliable power to an area. It shows thermal power providing base-load (nuclear can do that as well) and the need for “dispatchable” power. That is energy sources you can ramp up and down to follow demand. Hydro is very good for that. Batteries might be able to do it in the near future – but at a cost. EDF’s Sizewell B played host to an OSART review 5th – 22nd October 2015 which has just published its findings. OSART is the IAEA Operational Safety Review Team. Under this programme, which has been in existence since 1982, international teams of experts conduct in-depth three-week reviews of operational safety performance at individual nuclear power plants. These reviews are conducted at the request of the government of the host country. These “experts” are drawn from other nuclear power plant around the world. They provide the host station with advice and also take back to their home station a number of ideas about how safety can be improved drawn from the discussions with the host site and the other experts. A win-win situation. They thought that some of the conditions under which alerts were issued were too qualitative. Examples include “Emergency Services personnel are required to make access to a Radiological Controlled Area (RCA) in significant numbers”, “A significant increase in site radiation levels is observed”, and “An increase in containment radiological and/or environmental conditions is observed”. The station is encouraged to make all conditions for the classification of an emergency more quantitative rather than qualitative and specific to the Sizewell B station”. This doesn’t seem too serious a fault and easily rectified if the desire exists. More interestingly the team report that “The process used by the station to assess off-site radiological consequences, transmit data and recommendations to the public authorities has not been optimized to reduce unnecessary delay”. This is an area where new technology keeps moving the boundary of the possible. There also seems to be a move away from the dose assessment expertise being within the operator’s company to being within the local authority and central government. The team’s suggestion is that the dose-rate measurements taken on the site fence by the Emergency Perimeter Gamma Monitoring System (EPGMS) can be provided in real-time to the local authorities to “measure the extent of radiation contamination around the site”. They also suggest that an Operational Intervention Level could be put on EPGMS to lead to a declaration. In the past both of these moves have been resisted because the EPGMS measures external radiation dose whereas most of the public exposure results from inhalation of the plume and, unfortunately, there isn’t a usable relationship between the two unless you make assumptions about the isotopic and physical composition of the releases. EPGMS will react to noble gases such as 41Ar, which have virtually no public dose implications, but not to some actinides which can lead to high doses. It may be worth having another look at this issue. You sense that international teams are uncomfortable with the UK planning philosophy of planning in detail for the worst reasonably foreseeable fault and having outline plans to manage less likely but more severe faults. They state that “The UK approach is for these detailed plans to provide the basis for a more extensive response to even less likely but potentially more severe consequences (what the UK refers to as “extendibility”). This approach meets UK regulations but is different to that used in most other countries who base plans on events involving severe damage to the reactor fuel”. They then suggest that “the station should consider benchmarking its methodology to conducting emergency planning hazard assessment against the methodology used by similar stations in other countries to ensure that events involving severe damage to the reactor fuel are adequately addressed in emergency plans”. Which seems to suggest that they consider turning their back on UK regulation and advice. In truth there isn’t as much difference as this might suggest. There is a national programme underway at the request of DECC (now Department for Business, Energy and Industrial Strategy) and the Scottish Government to review the ability of local authorities to extend countermeasures to protect the public in the event of a severe nuclear accident. What is important is that we have a system for ensuring that proportionate arrangements are made for the whole range of accidents that are conceivable. This should be kept under continuous review but I don’t believe that the UK is getting this area wrong. The current UK system is explained in Appendix D of the Governments’ Nuclear Emergency Planning and Response Guidance. ONR reported that “the IAEA OSART mission presented an overview of its findings to EDF NGL, ONR and Department of Energy and Climate Change (DECC) at the mission exit meeting. The mission identified recommendations, suggestions, good practices and good performances. Recommendations were included in the areas of operations, maintenance and operating experience feedback. EDF NGL has responded positively with a commitment to take action in regard to the recommendations with associated action plans”. Contrary to what some may think the nuclear industry is always ready to hear constructive, expert feedback on their operations. OSART visits are exhausting for the visitors and hosts alike but play an important role in improving nuclear operational safety around the world. This visit to SZB has raised some points about their emergency preparedness and response but is generally impressed and supportive. There will be an OSART follow up review at Sizewell B in the first half of 2017. The success of OSART recommendations can be judged from the Figure taken from the OSART pamphlet which shows the resolution of issues raised by the time of the follow up meeting which is usually about 18 months after the visit. What do wind farms and nuclear power stations have in common? EDF have launched a competition to develop new techniques for inspection of nuclear power plant and wind farms. Check it out if interested, the EDF Energy inspection Innovation Challenge. Author keith.i.pearce@btinternet.comPosted on July 22, 2016 Format AsideCategories Interesting publications & events, UncategorizedLeave a comment on What do wind farms and nuclear power stations have in common? 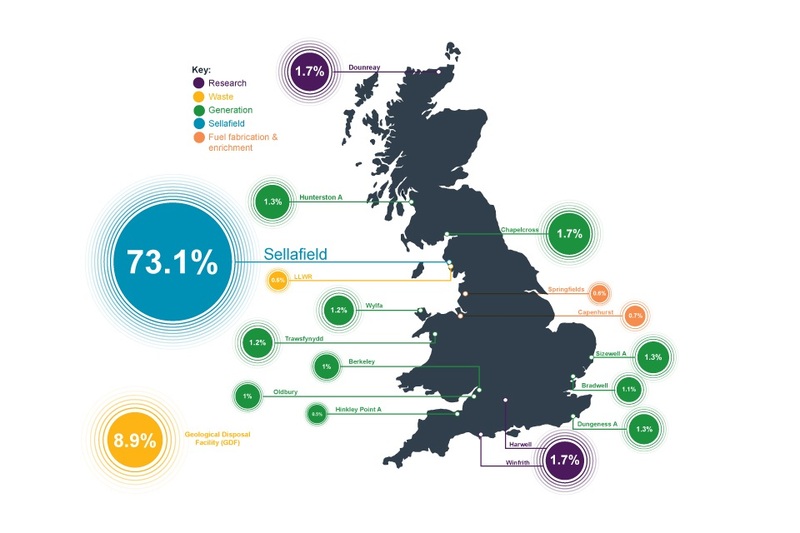 If you’ve got a spare 117 Billion Pounds (GBP) then you could take over the job of decommissioning the UK’s nuclear liabilities (17 sites in 120 years). That’s a lot of money! (See here). This report is the MOD’s response to a consultation about where the used Reactor Pressure Vessels (RPVs) from decommissioned nuclear submarines should be stored for the next few decades. It seems that there was little to choose between the handful of sites considered “Site assessments concluded that all five of the shortlisted sites were suitable and able to safely and securely store the RPVs”. Capenhurst was identified as the best option largely because they already have a suitable building so the planning process will be easier. 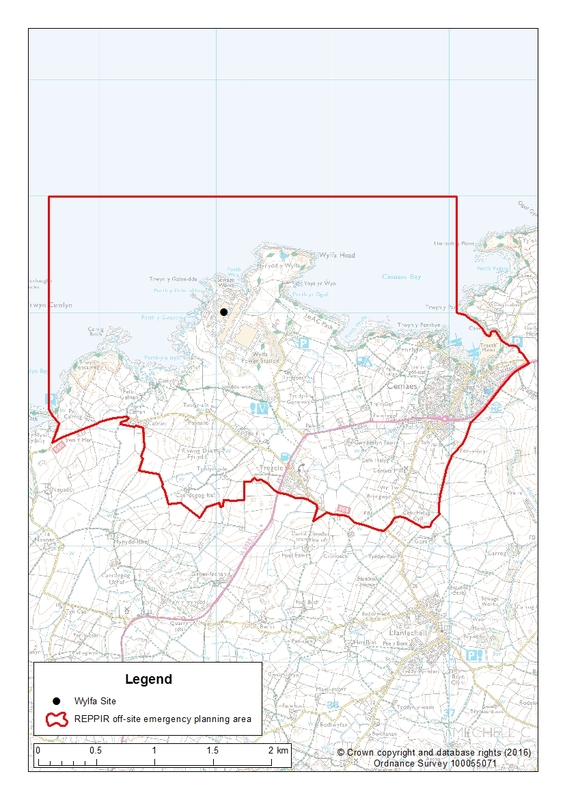 The ONR have published their review of the Wylfa off-site planning area. (Ref). This is another rather odd decision where they have chosen to increase the area in a way that includes a significant increase in affected population despite the fact that the nuclear reactors are now shut-down, depressurised and cooling. The ONR PAR agrees with the operator that the REPPIR test for inclusion in an off site plan extends about 900m from the reactors. Setting a planning zone of 1 km, which might seem sensible, would include about 14 people. However, ONR argue that this is not enough people for any plan to be credible so they set a larger zone including the homes of over 1000 people. Suffolk has rendered the stretching of planning zones meaningless by sensibly reducing the size of the automatic countermeasure zone around the Sizewell sites when Sizewell A dropped out REPPIR off-site planning despite the ONR increasing the size of the REPPIR off-site planning zone for Sizewell B. So now we are not sure what the area ONR defines is for.